Unlike this past spring, when I traversed the US from one end to another, this fall’s talks and appearances will keep me close to my slightly upstate NY home. I’ll be wearing all my various hats for these events — nonfiction writer, vegan cookbook author, and artist, so I’m really looking forward to that. Friday, Oct. 4 – 26 – Visual Studies Workshop, Rochester, NY – Opening reception for I Do? — a group exhibit about marriage equality. Alas, I won’t actually be at this opening, but it promises to be a fascinating exhibit exploring this hot-button issue. 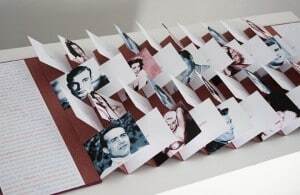 My most recent limited edition book, Why You Can’t Get Married: An Unwedding Album, will be part of this exhibit. Saturday, October 5 – Catskill Animal Sanctuary, Saugerties, NY – CAS’s annual Shindig will be filled with farm animals, food, speakers, demos, and lots more. 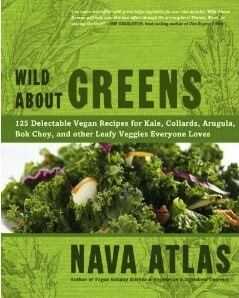 I’ll be demonstrating how to tame kale, from Wild About Greens at 2:30. October 14, 2013 – February 21, 2014 – University of Washington Libraries, Seattle, WA: “Under the Wings of Artemis: Scholars, Artists and the Places Between.” This beautifully titled of exhibit of artists’ books from the U of W special collections will include one of my signature pieces, Sluts & Studs,which will also be discussed in a book that accompanies the exhibition. I don’t know if there will be a formal opening for the exhibit, but, since I’ve already traveled to the west coast twice this year, chances are I won’t be attending. Friday, November 1 – Oblong Books, Rhinebeck, NY – A reading by several of the contributors to the anthology A Slant of Light: Contemporary Women Writers of the Hudson Valley. I’ll be reading my essay, “Self-Acceptance: A Hard-Fought Battle.” I believe this event begins at 7:00 but please confirm at Nava’ Fall Speaking and Exhibit Schedulecloser to the date. Sunday, November 3 – Pine Plains Library, Pine Plains, NY – This will be my only solo talk this fall; an in-depth but fun demo of recipes and tips from Wild About Greens. The event runs from 2pm to 4pm. Saturday, November 9 – Millbrook Winery, Millbrook, NY – Sip & Sign, a local author booksigning event. Sample local wines, and get a little tipsy while exploring books by Hudson Valley authors. I’ll be there with several of my titles, including Wild About Greens, Vegan Holiday Kitchen, and The Literary Ladies’ Guide to the Writing Life.